Hopkins first completed project in Japan will be the tallest building in Tokyo’s financial centre. 19th April 2007 sees the official opening of Hopkins Architects’ Shin- Marunouchi building, a 198m ‘skyscraper’ in the Marunouchi district. Situated directly opposite Tokyo station, the gateway to Japan, and on the main ceremonial axis to the Imperial Palace, the building is arguably the most important and publicly recognisable site in Japan. The Shin-Marunouchi building, representing one of Mitsubishi Estates’ thirty- two properties in the Marunouchi area, is part of the First Stage of the Marunouchi Redevelopment Project. Stage Two will begin in 2008 with the reconstruction of the Mitsubishi Shoji, Furukawa and Marunouchi Yaesu Buildings. MEC earmarked the historic neighbourhood of Marunouchi for regeneration in 1998, with the aim of turning what formerly served purely as a business centre into a bustling 24-hour district. Their competition was Tokyo’s other successful financial districts of Shiodome and Roppongi. Currently Marunouchi accounts for 20% of Japan’s GDP and 10% of companies listed on the first section of the Tokyo Stock Exchange are located in the area. Hopkins Architects were invited to tender for the Shin-Marunouchi through two closed design competitions in July 2001, along with a number of world- renowned architects. They have partnered with local practice MJS (Mitsubishi Jisho Sekkei) to create the tallest of six buildings that make up the complex. The brief was to build upon an existing, 1952 constructed, nine-storey building in a truly modern style, whilst addressing the historical setting. Hopkins have created an additional 35 floors above ground and four below, offering a total of 195,000 sq metres of retail, public and office space. Creating a building of this height in Tokyo’s prestigious commercial district is remarkable for an area that has strict planning restrictions that prevent buildings overlooking the Imperial Palace. The spacious ground floor gives visitors a sense of walking through the streets as they pass under a large arch leading to the entrance to Tokyo Station. A new connection directly into the underground and public transport system has been created at lower ground level. Floors one to seven are the commercial zones of the building and will house more than one hundred and fifty retail stores, offering meeting and relaxation rooms, gym and changing facilities in addition to office space. Floors nine to thirty- seven have been pre-leased as office space to a collection of high profile Japanese and international companies. 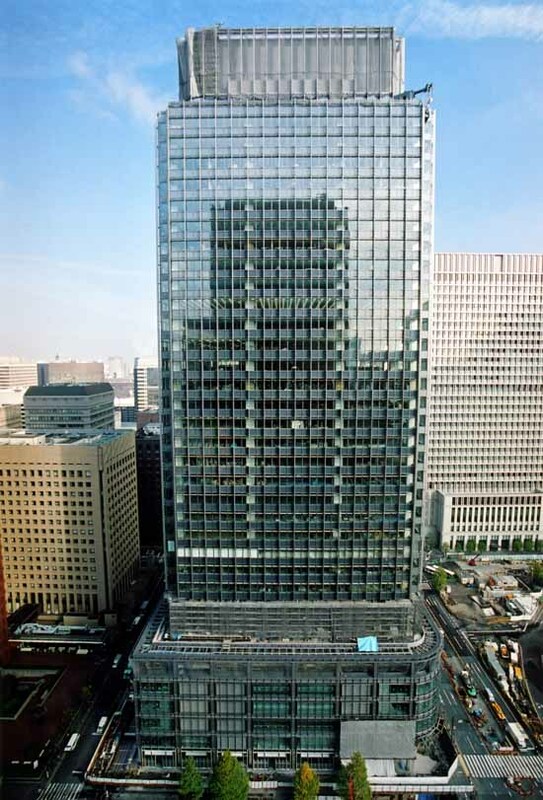 The Company’s advanced environmental policy is reflected in a number of innovative features incorporated into the fabric of the building and the tenth floor houses a centre dedicated to the promotion and development of environmental preservation in Tokyo’s key business areas.